When we have free time after a wedding at City Hall we like to explore the surrounding areas. I happened to find an amazing store right at the edge of Hayes Valley called PALOMA. The owner and resident master craftsman Larry is not only friendly, he let me hang out inside the shop the whole afternoon just watching him work on things. His specialty is hand-stitched leather goods from wallets to travel bags. The selection of material is amazing and he will walk you through the entire process. I ended up getting a new leather tote bag that is buttery-soft and a wallet. Check them out sometime. It's easy to get wrapped up in all of the details of your wedding day. From finding the right dress to the perfect pair of cuff links, every little thing matters so much. But when you are all dressed and ready what is the best way to make it to the City and City Hall without causing undue stress and hardship on yourself and your guests. Here are some tips to try and alleviate this confusion. If you have a morning ceremony it can get very, very busy on the commute into the city. If you are driving from the East Bay or the Peninsula the drive can easily become a two-hour plus nightmare if you don't leave very early. If you can take BART in we highly-recommend this option as you can exit at Civic Center and walk to City Hall in less than ten minutes. No worries about finding a parking space, or feeding the meter. You can arrive at City Hall early and change in one of the private bathrooms they have. Yes it is decidedly less romantic than driving away into the sunset but you can't beat the practicality. Well if you know San Francisco traffic during the week then you know trying to get into the City from 7am to around 11:30am can be really bad. Even if we have a shoot at 10am, we still leave the house before 6am to cross the bridge before traffic gets insane. I know this sounds a little silly, arriving hours before the shoot and just sitting around. In fact, we like to arrive early as we can snag parking at a cheaper rate (more on this later), grab a leisurely breakfast, and double-check gear and appointments all before 8am. I have seen firsthand what it is like to get to the toll crossing before 6am and breeze through, and go 15 minutes later when it seems like every commuter in the Bay is trying to get across the bridge. Those few minutes can mean a difference of over an hour in commute time. I love to be driven around. It's so carefree and helps me to relax. Taking an Uber from your hotel to City Hall is one of the best and most convenient ways to get to your ceremony. You don't need to worry about parking fees and feeding the meter, you just get dropped off in front and you are good to go. If you are staying in the City proper, this is one of the best ways to get to City Hall. 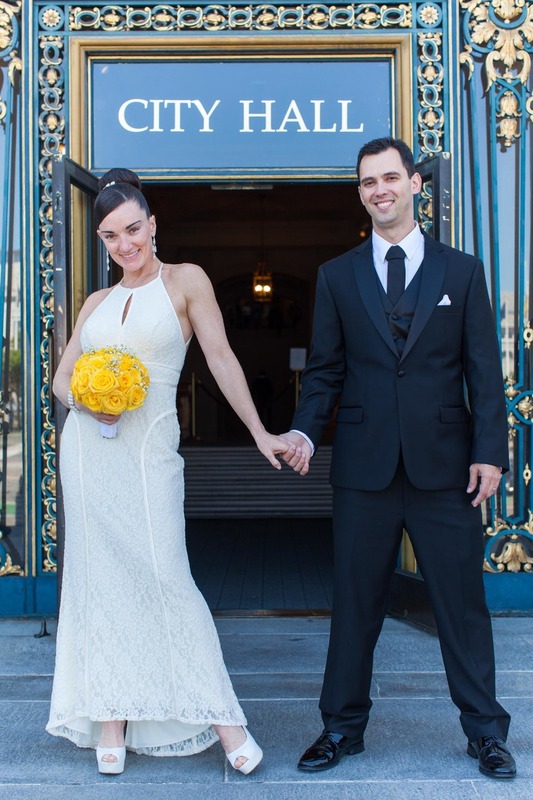 While we are well-known for our work at San Francisco City Hall we want share some of best locations in San Francisco to take wedding photos. This is Part One of an ongoing guide. The Palace of Fine Arts. The Palace of Fine Arts and a surprise cameo on the bottom-left by a Swan. I would venture this is the most-photographed public location in San Francisco for couples, families, and any possible occasion in-between. Everyone stops here to look at the lovely lake, marvel at the Swans and Ducks, and take some beautiful photos underneath the dome. You can make a circuit around the entire place in 15-minutes, stopping along the journey to take all different kinds of photos. While weekends tend to be the busiest, we also shoot here during the week when there are fewer crowds and we get a better chance at getting the perfect shot. The Golden Gate Bridge as seen from Fort Point. Less than ten minutes away by car we have Fort Point. Tucked away beneath the Golden Gate Bridge on the San Francisco side this location offers a million-dollar view of the Bridge and the Marina. On weekends the Fort is open to the public and you can photograph along the corridors and even the roof. Amazing light at all times of the day but it can get really windy. Also there is no elevator to the top so be prepared to walk up all those stairs to the top and back down again. Maiden Lane near Union Square is a great place for a quick shoot. Located in the heart of Union Square, Maiden Lane is an approximately two-block long street tucked away in between the hustle and bustle of the City. On afternoons there are outdoor tables where you can relax and have a coffee while doing some great people-watching. While the street is short, it is great as a backdrop for portraits. Timing is hit or miss here as they don't always have the place cleaned up and there can be cars, but we are good at working around that. Until next time, stay tuned for Part Two! Lovely ceremony complete, beautiful wedding photos taken, what could possibly follow such wonderful moments? I'm feeling a little guilty here. Not only do we offer the best Wedding Photography service at City Hall, we are also great at suggesting places to grab a quick bite. It's just not fair to our competition. To set the bar even higher we have compiled a list of our local favorites for you to peruse. This is an all-vegetarian restaurant located in the Fort Mason complex in the Marina District. Great views and the food is wonderful. Plenty of parking too. A truly special place and one of the most famous restaurants in the city. Reservations are indeed a must. For a romantic wedding day dinner it really doesn't get any better. And the weekend brunch is one of the best in the city. If you happen to be getting married on a Friday during lunchtime the selection of gourmet food trucks at Off the Grid is impressive. And they are all parked right in front of City Hall! From Senor Sisig to Korean BBQ, all of your cravings are covered. There are usually tables set out as well so you can people watch during the busy lunch hour. For those looking for a bit more, 5A5 easily serves one of the best steaks in the city. From its unique atmosphere to its attentive staff 5A5 is a wonderful place for any meal. There has been more than once occasion where we actually drive the bride and groom directly from City Hall straight to a celebratory cocktail. The bar program at Hillstone is exceptional as well as the food. No one in the city does classic American comfort food like this place. Reservations recommended. A little gem of a place in SOMA, Picnic on Third offers a new lunch menu everyday from Monday through Friday. Past standouts have been traditional Jamaican oxtail stew with rice and peas, and incredible roast meats. They also offer a Happy Hour menu after 3pm. Weekend brunch is a sight to behold, they do not accept reservations. Another funky casual place in SOMA, Garaje specializes in beer and burgers. It can get a little crowded after 5pm but the line moves quickly and there are two-levels for seating. Cash only. There is no food suggestion list for us without name-dropping Brenda's. There is always a line unless you arrive early (8am or so) but the staff moves things along at a brisk pace and before you know it you are sitting down to Beignets (try the flight of 4) and some delicious gumbo. Just three blocks from City Hall this is a great place to grab breakfast or lunch. A true San Francisco landmark. Emerson loves this place. Seating is along a long counter and the wait can be over an hour during peak times. But if you can get inside there is no better place to get fresh chilled seafood and chowder. Everything is good on the menu and remember it is cash only. No dinner service here, just lunch. While there are several OSHA locations scattered across the city, we are decidedly loyal to the Tenderloin location. It stays open the latest and if you ask nicely they will make their Thai Fried Rice with purple shrimp paste just like they do back home in Thailand. Delicious and authentic, what more can you ask for? A North Beach institution. This Italian deli has been around for decades and serves some of the best sandwiches in the city. No sitting inside but they do have a few tables in front you can hopefully snag to eat your meal and watch the passerby. When is the best time to book my ceremony appointment? This post is in response to a question we get all the time: when should I schedule my ceremony appointment? Of course, there really is no "perfect" time to photograph at City Hall, our goal is to simply find the ideal balance between light and people. Other things to consider are guests, availability of friends and family, and any plans you may have for immediately after your ceremony. Since City Hall is indoors, it relies on sprawling windows as its main source of light. These windows diffuse the natural light, resulting in pockets of flattering light throughout the building. Earlier appointments have the benefit of brighter ambient light, but there is still plenty of lovely light later in the day. If you are considering going to an additional location after your ceremony we do suggest having your City Hall ceremony start by 2pm at the latest. This will allow sufficient travel time to the next location after we are done at City Hall. We are happy to provide transportation for up to 3 people for these on-location shoots and can return you to City Hall afterwards. Below is a picture of City Hall on a Friday at noon. This performance is a part of a series on cultural heritage taking place for the next 5 months at City Hall. From the picture you can see the majority of spectators are tourists, who typically enjoy perusing throughout the building around lunch time. Keep in mind that City Hall is also a fully-functioning government building. It hosts UN council meetings, protests and rallies, the Giants and Warriors championship parades, and a number of other city functions. There is typically a press release on the official San Francisco City Hall site stating if there will be any kind of closure or event taking place. It is a good idea to check this calendar against your ceremony date to make sure there is no conflict. The ceremony itself is generally quite short. Rarely do they last more than 5 minutes. Therefore, consider what you'd like to do afterwards (besides shooting with us of course! ), i.e. are you planning lunch/dinner? Have you made reservations/arranged transportation? Remember, a little preparation beforehand will save a lot of stress on your big day. Also check out our article on food for ideas on great places to eat near City Hall. All this being said we have to say that there is no bad time to take pictures at City Hall. Morning, mid-day, or late afternoon all have their own unique characteristics of light and we utilize them to full effect. Book with confidence knowing we will use this light to create the best possible images for you. 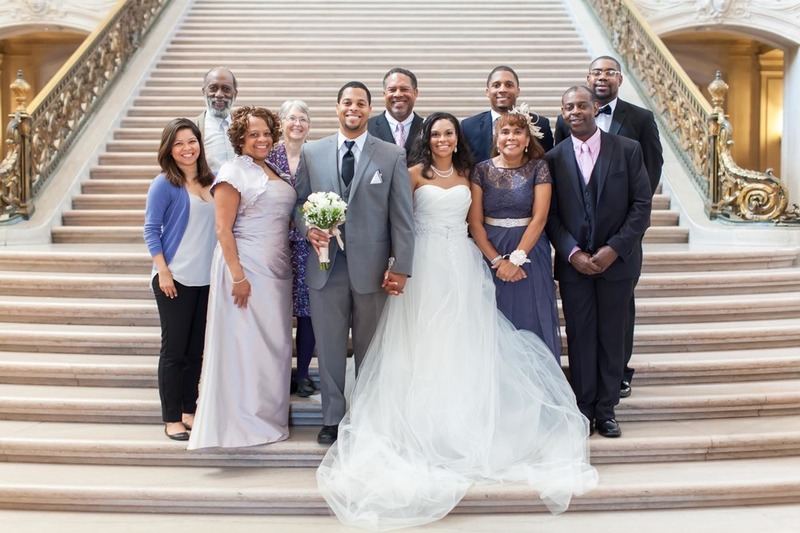 With such great natural light, San Francisco City Hall offers stunning backdrops for photographers and visitors alike. This article highlights five great spots for taking pictures, and to helps provide people with a sense of familiarity with the building prior to their visit. The grand staircase leading to the rotunda is one of the first things you'll see once you pass security and enter the main building of City Hall. This is arguably the most difficult location to photograph since there are often dozens of people trying to get the same shots. However, with a little patience and luck, great shots await. Staring out at the rotunda and the vast beauty of City Hall, the Governor's balcony is a perfect location for couples and group shots alike. While sometimes difficult to secure unattended, it highlights the architectural beauty of City Hall. These windows are an absolute must for couples visiting city hall. Not only does everyone have a blast here, the photos turn out incredible. Further, since most people avoid exploring the upper levels of city hall, these hallways are usually empty. In order to truly appreciate the magnificence and grandeur of San Francisco's City Hall, one must venture up to the fourth floor balcony. Here you'll fine beautiful light for group and couples shots alike. Technically not inside of City Hall, the trees lined up outside the front entrance make for even more great photo opportunities. Living above a massive underground parking lot, these trees offer a great spot for people to capture SF City Hall in a different light.